British expat Marc Fosh, who is the chef-owner of Mallorca’s Simple Fosh restaurant, shares his modern take on the truffle. The key ingredient to this sweet and savory dessert? 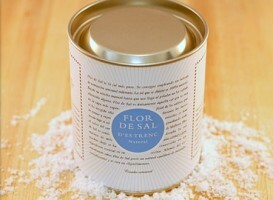 Flor de Sal d’Es Trenc sea salt — large, luxurious, melt-in-your-mouth salt crystals hand-harvested from the salt flats found on Es Trenc beach in Mallorca, Spain. Roast peppers in a hot oven or under a broiler until well cooked. Place them in a bowl and cover them with saran wrap. When they are cool enough to the touch, peel and remove seeds. Then put them through the blender to make a purée. Soften gelatin sheets in cold water. Bring water and sugar to boil. Drain gelatin and add to water-sugar mixture on stove. Stir until layers have dissolved. Add raspberry pulp and vinegar. Leave to cool for 6 hours in fridge. Bring cream, milk and Gran Marnier to the boil. Remove from stove and add chocolate in pieces. Stir until chocolate is dissolved. Add olive oil and stir in well. Place in bowl and leave to cool in fridge. Cut the raspberry gelatin into small squares. Using a spoon, scoop a small ball of the chocolate mixture and place in the middle of the plate. 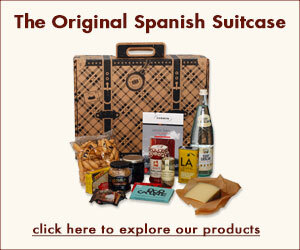 Add a sprinkle of Flor de Sal d’Es Trenc Natural. Place several raspberry “dice” around the plate. Garnish with red pepper jelly and whole raspberries.